I’ve taken to the outdoors this week. No, I’m still sleeping at a friend’s house and not on park benches, but it’s been wonderfully cold outside, so I’m embracing more of the outdoor elements of vagabonding this week. I could just be like the Phantom of the Office Building, who lurks in the shadows and heating ducts, emerging at night to wreak havoc and pretend that this place that I have no legal claim to actually belongs to me. Wow, it’s sort of scary how closely those lined up. Downsides of this plan include (1) the fact that the building is probably most definitely haunted based on all the creepy noises it makes when I’m alone there in the morning, (2) the fact that the space under my desk isn’t big enough for my full size mattress, and (3) the fact that so many people from work read my blog. Damn my inability to keep thoughts to myself! Is scurvy still a thing? Can humans still get scurvy? If so, I should probably get that checked out. And yes, all you health conscious people who eat nothing but vegan flavored fiber, I know what you’re going to say already about healthy diets and kale… but in my defense, there is no drive-thru vitamin and salad restaurant. Also, fruit costs a bajillion dollars! I mean seriously, kiwis cost $100 a pound now, meanwhile $3.50 will buy you 19 burritos at the Taco Bell. My mother says that I’m probably being dramatic about the scurvy, and it’s probably just a cold. But colds are for indoor dwelling people. As a quasi-homeless person what I have is probably a touch of consumption. Or the black lung. Or perhaps the plague? These things are all possible. I went to Boone today. It’s my annual trip that I take with my mother each October because we love cold weather and pretty leaves and happiness. And we had a great time because my mom is the greatest human who has ever walked this planet. Also, there’s something delightful about leaving town and pretending that you don’t have any horrendous, gaping life problems. In fact, I like the idea of running from my problems so much that I am this close to ghosting on my whole life and just hopping on a plane to Paris, where I will smoke long cigarettes and lay draped across pianos, and be a muse to some tortured artist. Hmmm, that doesn’t sound half bad. Oh, but wait- I don’t want to learn French. Scratch out the word PARIS and write SCOTLAND, and then add 1-7 layers of thick sweaters and warm blankets to the picture of me smoking on the piano. And actually, I don’t like smoking so change CIGARETTES to EATING DONUTS. Oh, and change MUSE to SMARTASS BLOGGER. Also, change TORTURED ARTIST to HOT SCOTTISH GUY WITH A THICK ACCENT I CAN’T UNDERSTAND, BUT WHO CARES BECAUSE LOOK AT HOW THICK HIS F*CKING ARMS ARE! Yup, that looks more accurate. The single mothers looking for other single mothers to share houses. There were a surprising lot of these. I can only imagine (as someone who grew up with a single mother and saw how crazy difficult it was) that these women woke up from their solid 30 minutes of sleep per night and thought “Huh, you know what would be great? If I could get some more children up in here! But children I have no jurisdiction or control over. Yup, that is what I want!” Well, once again my childless-ness keeps me from what sounds like an ideal and stress-free living situation. There was one ad that was uploaded several times a day that read like a straight Tinder dating profile, complete with pictures of the gentleman. A LOT of pictures of the gentlemen. More pictures of him, in fact, then of the house. Hmmmmmmm. What is interesting about this fact is that he posted the same ad every few hours. Now, I use Craigslist a lot; not to lure innocent people to my murder house, but to sell furniture. Anyone who has used Craigslist knows that you can only renew a post after a certain amount of time has passed. So that means that this guy wasn’t just renewing this post, but he was actually taking the time over and over each day to re-upload his dating profile ad. That is quite a phenomenal waste of time and creepy amount of commitment persistent attitude. The live in mistress. No… I’m not kidding at all. A human male put up an ad saying he had a room available that you could live in for free, but you had to be his mistress. Oh, also, his girlfriend lives there as well, but don’t tell her please. I wish that I was kidding, but I’m not awful enough to make that sh*t up. 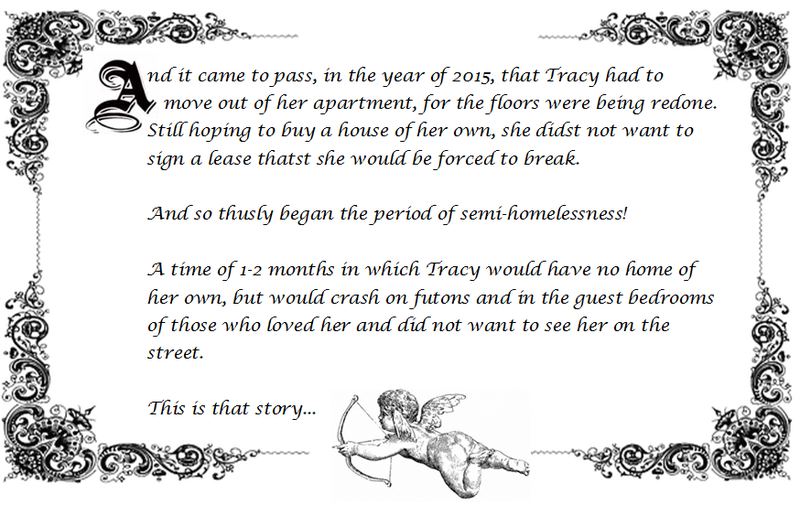 You may be saying, “But Tracy, what does this Craigslist endeavor have to do with the ‘Oustside Edition’ of your quasi-homeless posts?” Well, how nice of you to ask. Let me show you around my new home. It’s just under this bridge here in Durham. I’ve hung some lovely plastic tarps in a hue of safety orange to block the wind. You’ll notice it’s in one of the less stabby parts of town, because it’s true what they say about location being key in real estate. Please wipe your feet before coming in, but watch out for needles. If your cold there is a meth lab next door that puts out a fair amount of heat if you huddle by their back door. 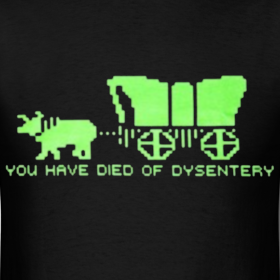 My life is essentially now just a living version of the game Oregon Trail. For serious, if I traded my versa for a covered wagon you wouldn’t be able to distinguish one from the other. In fact, I drive a hatchback, which is essentially a station wagon, so YES I am actually travelling the US in a wagon. We here at FOR A RAINY DAY hope that you are enjoying these adventures in Quasi-Homeless, because as long as you’re still laughing, then it’s not depressing! In other news, if anybody knows of any cute and very cheap apartments and/or wealthy single men who don’t mind the sass-mouth then please let me know. 20 Oct	This entry was published on October 20, 2015 at 10:49 pm and is filed under Uncategorized. Bookmark the permalink. Follow any comments here with the RSS feed for this post.